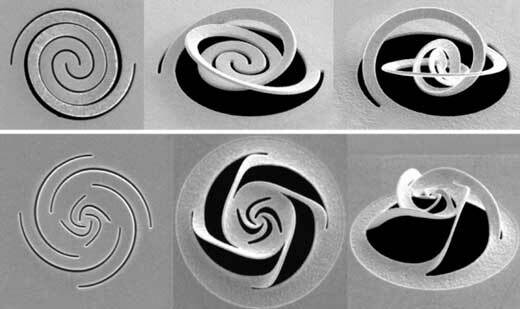 (Nanowerk News) Nanokirigami has taken off as a field of research in the last few years; the approach is based on the ancient arts of origami (making 3-D shapes by folding paper) and kirigami (which allows cutting as well as folding) but applied to flat materials at the nanoscale, measured in billionths of a meter. The findings are described today in the journal Science Advances ("Nano-kirigami with giant optical chirality"), in a paper by MIT professor of mechanical engineering Nicholas X Fang and five others. Using methods based on standard microchip manufacturing technology, Fang and his team used a focused ion beam to make a precise pattern of slits in a metal foil just a few tens of nanometers thick. The process causes the foil to bend and twist itself into a complex three-dimensional shape capable of selectively filtering out light with a particular polarization.